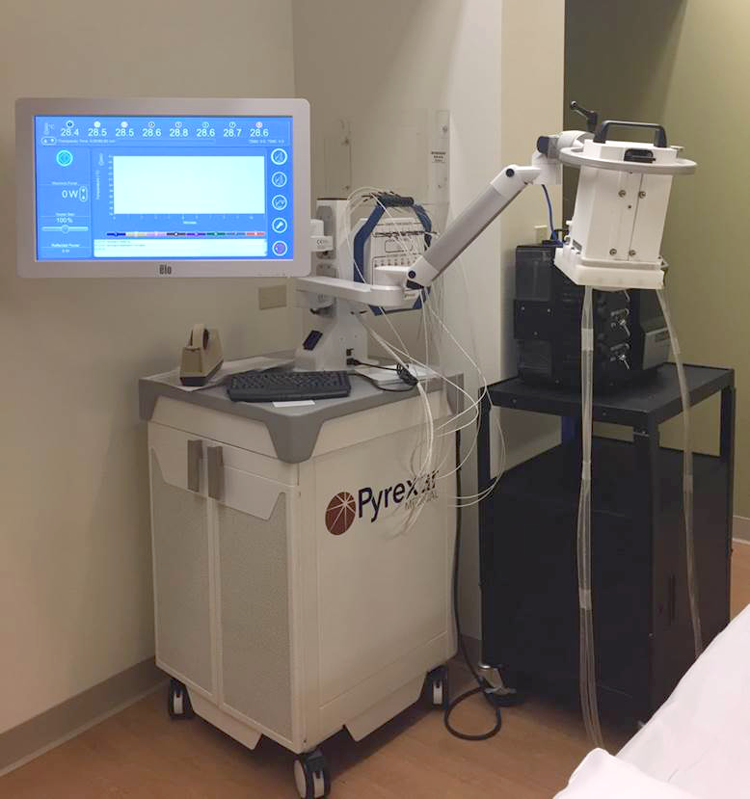 Siteman Cancer Center now offering superficial and interstitial hyperthermia, using the Pyrexar Medical BSD-500, to their cancer patients. 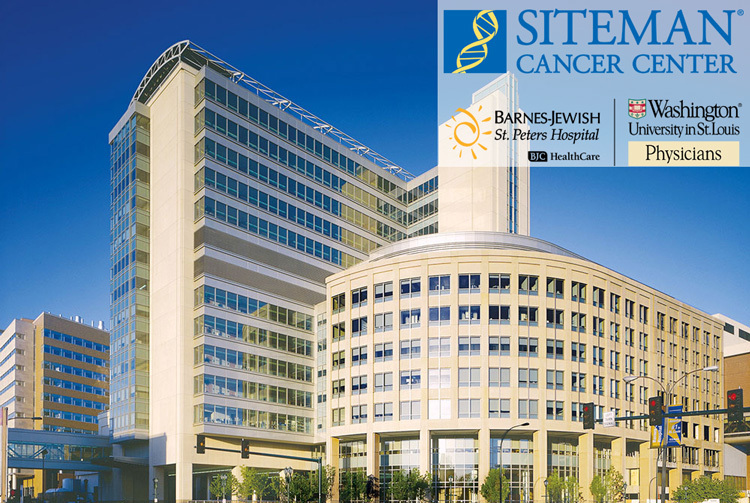 The cancer center is located at the Barnes-Jewish Hospital within the Washington University Medical Center complex in the Central West End area of St. Louis, Missouri. Although the system will be utilized to treat a variety of indications, Dr. Imran Zoberi, Chief of Hyperthermia Service and Clinical Director of Radiation Oncology at Barnes-Jewish, is targeting recurrent chest wall tumors. Treatment issues for recurrent breast cancer include radiation dosage limitations, post-surgical skin folds, scaring and lesions that can make this form of recurrent breast cancer a challenge to treat. Dr. Zoberi, along with William Straube, Research Associate Professor of Radiation Oncology, have been long-time users of hyperthermia as an adjunct to radiotherapy. The new BSD-500 has replaced a retired Labthermics Sonotherm 1000. According to a randomized phase III clinical trial (Jones study) published in the Journal of Clinical Oncology and conclusions of a meta-analysis published in the International Journal of Radiation Oncology, Biology and Physics, adding hyperthermia to radiation therapy can potentially double complete response over using radiation alone in recurrent breast cancer. Randomized trial of hyperthermia and radiation for superficial tumors.Randomized trial of hyperthermia and radiation for superficial tumors. Jones EL, Oleson JR, Prosnitz LR, Samulski TV, Vujaskovic Z, Yu D, Sanders LL, Dewhirst MW. Datta NR, Puric E, Klingbiel D, Gomez S, Bodis S.
We just returned from a trip to India to attend the SCRAC (Society of Cancer Research and Communication) meeting in the coastal town of Juhu, Mumbai, India. We had the opportunity to meet radiation oncologists and cancer specialists from the region, and to present our pitch for hyperthermia. 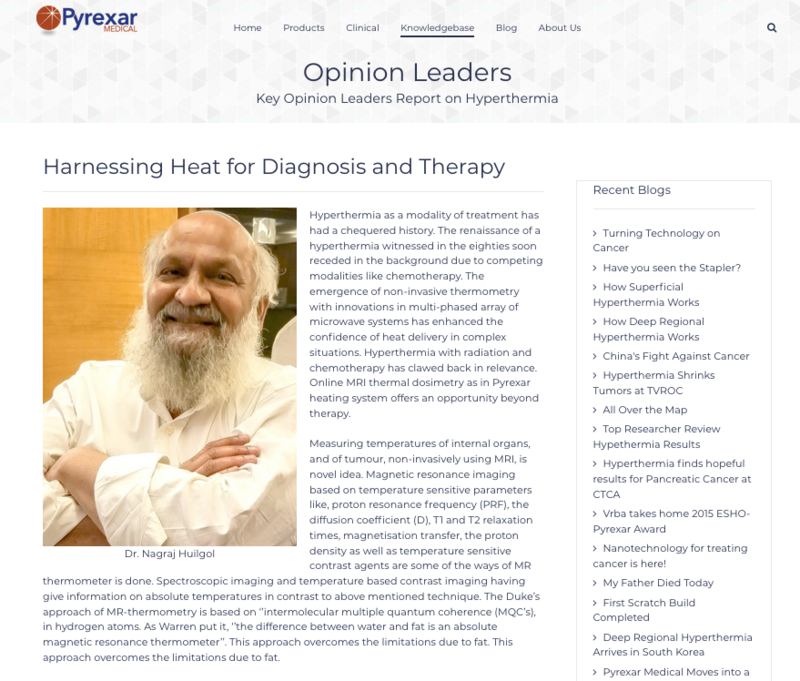 We have received positive indications that there will be several Pyrexar Medical Hyperthermia suites installed in India in 2019. India is projected to be the world's most populous country by 2024. Surpassing the population of China, it is expected to be home to more than 1.7 billion people by 2050. With this continuing growth, the demand for health services also grows. The opportunities in the country are vast and it appears hyperthermia has a chance to gain a foothold as a valuable adjunct cancer treatment. Group discussion to explore the possibilities to harness heat for diagnostics. Last month the local affiliate in Salt Lake City, UT (headquarters for Pyrexar Medical) aired a five-part series on the use of hyperthermia in the treatment of cancer. The report focused on one of our customer sites, Gamma West Cancer Services, and their use of interstitial hyperthermia in combination with brachytherapy. We have added English language captions to the video series. This is an excellent opportunity to share this life-saving information on your social media websites. The more individuals that learn about this treatment, the more lives we can change. Visit the Pyrexar Medical YouTube Channel or use the links below.